Maureen Kenner was known in the Providence, Rhode Island community for the relationships she had with her students and their families. A special education elementary teacher for 35 years, she was recognized as Providence Teacher of the Year in 2003 for being a compassionate and devoted educator. In 2014, Maureen was diagnosed with stage four colon cancer—an experience that after so many years of being depended upon by her students, forced her to become a student again. After 63 rounds of chemotherapy and seven months in hospice, she passed away peacefully in March 2018. She was cared for by her three sons, including Daniel Kenner, during four long but loving years. Buddy, Maureen’s husband and love of her life, was diagnosed with early-onset dementia just months before Maureen would herself be told that she was suffering from an aggressive and terminal cancer. Inspired to hold close the stories of his parents from happier times, Daniel wrote an intimate and lyrical oral history of his family, titled Room for Grace, that launched October 3, 2018. “The community was totally embracing. I really feel like that gave a lot of strength to my mom knowing that other people were helping fight for her,” he said. 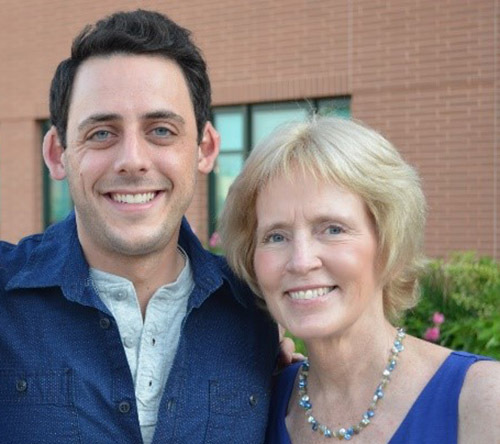 Daniel defined his caregiver role as an opportunity to be there for his mom, even when it meant taking care of mundane household tasks like making lunch, grocery shopping or cleaning. Maureen, who had spent decades being her students’ advocate and caregiver, had to learn to embrace help and letting others carry her when she needed to be carried. It’s through saying “yes,” Daniel said, that she found dignity, love and respect from her community. It is ultimately how she acquired grace, he said. People in the community took turns cooking his family dinner, watering the lawn and stepping up to help with other tasks. “She knew how to be a good teacher and she had to re-learn how to be an exceptional student,” said Daniel. One of the stories in the book is about Maureen’s students taking on the monkey bars. On Monday a child made it to the first rung. On Tuesday he made it the second. By Wednesday he swung to the third rung and then fell. Concerned, Maureen made her way to the student to make sure he was okay, but before she could get to him the boy stood up and did a celebratory dance. Ten percent of every copy of Room for Grace sold will be donated to charities such as, but not limited to, the National Foundation for Cancer Research. More on the book and Maureen’s story can be found at RoomforGrace.org.